St Austell – The tropical tranquillity beneath the striking domes of Britain’s Eden Project, paid for with EU cash, is a sweet-scented haven from the bitter political row over the bloc’s budget. The Eden Project is one of Britain’s top tourist attractions but few realise that its giant, bubble-like biomes were largely funded by European Union money targeting the continent’s most deprived corners. 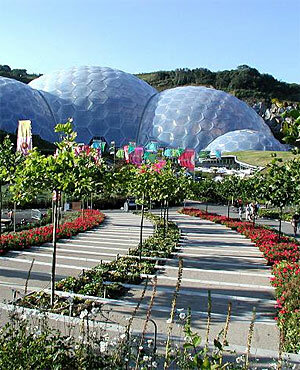 Created from a former clay pit in Cornwall, England’s most southwesterly county, the eco-attraction brings in around a million visitors a year to enjoy its tropical and temperate flora from around the world. While outside it is a cool, foggy November day, inside the Mediterranean Biome, gentle birdsong, the sound of a trickling stream and smells of herbs and citrus fruits fill the air. Across in the larger Rainforest Biome, the world’s largest jungle in captivity, the humidity hits 92% and temperatures can reach 45�C at the swaying canopy viewing platform. Near the waterfall, tropical fowl shelter under ruffled fan palms while heavy drops of condensation rain down from the translucent plastic roof. Opened in March 2001, the Eden Project has received about �37m of EU funding, without which it would have struggled to get off the ground. “It would have been a much-reduced project. “I genuinely think we would not have gone ahead at this size,” said Eden’s development director Dan James. “We’re really grateful but we’d like to think that they’re equally grateful for the economic impact we’ve brought to the region” – an estimated 1.2 billion boost to the economy. The Eden Project has benefited from EU development funds which classed Cornwall among the likes of Bulgaria, Romania and southern Spain as some of the poorest places in the 27-nation bloc. The investment seems to have worked, as the attraction now employs 500 staff and has generated about 2 000 peripheral jobs in the local area. It is hoping for further cash from the EU’s 2014 to 2020 budget to invest in its new HOW2 exhibition space, showcasing sustainable technologies. That budget has yet to be agreed however, and will be the subject of a bitter fight between EU leaders when they meet in Brussels on Thursday. British Prime Minister David Cameron has vowed to veto any real terms rise. But lawmakers in his Conservative Party and the Labour opposition are angrily demanding Brussels implement the same austerity cuts that many of the 27 member states – including Britain – have introduced following the financial crisis. Britain is one of the richest members of the European Union and a net contributor to the budget – a cause of perpetual anger among eurosceptics, especially those in the anti-EU UK Independence Party.